After Tottenham’s midweek disaster at home to Manchester City, Spurs were hoping for a quick three points and a rebound away to Hull City(Tigers). Any one of the bottom ten teams would have done following Man City, with everything so tight in tenth through twentieth position there’s plenty of reason for optimism when facing any of them. But Hull were tough for Spurs to breakdown at the Lane earlier in the year only able to come away with a 1-0 victory thanks to a Roberto Soldado penalty. There would be nothing to save Spurs this time around, however, and Tottenham had their worst performance in the Sherwood era. The match saw a return to Tactical Timmy’s much maligned 4-4-2 formation, which initially looked like a major tactical blunder as Hull have fielded a 3-5-2 formation at times this season. A back three came into popularity as the preferred counter to two striker systems and subsequently went away with the trend towards 4-2-3-1 and other single striker systems that made three centerbacks redundant. Luckily, Sherwood was spared being outclassed from the get go by Steve Bruce, as Bruce also opted to go 4-4-2. Hull paired their new strike force of Nikica Jelavic and Shane Long up top, with the two operating together with good effect. Despite the similar formations, the approach in possession of the two teams could not have been much more different. Spurs dominated possession with a 77% percent pass completion rate and 61% of the ball and looked for chances on goal with both slick passing counter attacks and sustained build up play. Tottenham’s two forwards, Soldado and Adebayor, worked the channels or dropped off into midfield to assist the build up play on a regular basis. 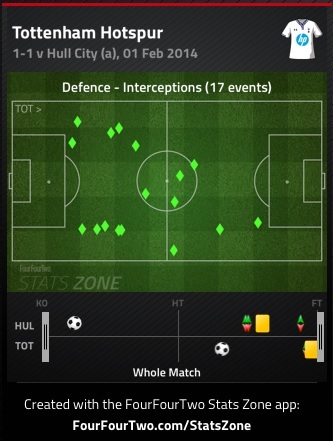 Hull’s front pairing stayed higher up the pitch looking to get onto the end of long balls and attack Spurs directly. Jelavic made himself useful with his physicality and Long used his excellent pace to good effect. The main tactical feature of the game was space in between the defensive and midfield lines, for both teams , when defending. It is no surprise to see this from Spurs in a 4-4-2 as their lack of a holding midfield player in four or five man midfields has been well, well, documented. But Hull allowed too much space in between their two banks of four as well and it’s a bit of surprise neither side took advantage of this more, as the two goals came from a sequence starting with a goal kick and a free kick. The opening goal came in the opening fifteen minutes of the match as both sides created excellent chances one after another in short order that perfectly exploited the other sides weakness. Unfortunately for Spurs, Adebayor’s volley was saved but Long was able to chip Lloris and put Hull ahead. The snapshot below shows, perhaps, Spurs best chance from open play, a series of short combination passing followed with a short cross from Soldado and an outstanding volley from Adebayor. Shortly after, Hull exposed Spurs’ lack of a holding midfield player and got their goal by pulling Vertonghen and Dawson, Spurs centerback pairing, apart vertically from one another as Vertonghen went forward to challenge Long in the air from a Hull goal kick and Dawson marked Jelavic. Neither Vertonghen or Long won the ball in the air but it fell behind them, came to Jelavic who flicked it into the path of Long who easily raced by Dawson and away from Vertonghen to score with a nice finish 1v1 with Lloris. Hull were content to keep playing the long game with both Jelavic and Long looking effective. And their long passing game was quite succesful, they completed 24 of 53 long passes(45%) while defensively, Long and Jelavic took away Spurs short passing options and were able to force them long. But Spurs only completed 12 of 39 long passes, 30%, and were poor taking free kicks inside their own half, completing just 3 of 10. Shane Long was an outstanding nuisance in this match, he committed five fouls in and around Spurs area, created two chances, scored a goal, received fifteen passes from Hull’s half into Spurs half, recovered possession twice, won five of his twelve aerial duels(four in Spurs half) and was fouled three times himself. He showed exactly why Hull brought him in, pace, good finishing and an ability to be generally very energetic and annoying to his opponents for 90 minutes. Hull setup their front pairing in their initial defensive block in between Spurs centerbacks and central midfield pairing of Bentaleb and Dembele while their midfield four took up positions around the halfway line. This was a more proactive defensive block than that set out by Tony Pulis when Palace played Spurs, Pulis allowed Spurs central midfield pairing plenty of possession and took away their other options, here, they were pushed further back and not allowed to easily receive passes from the back. But it did create the potential weakness of, again, space between the lines for Eriksen to operate freely. 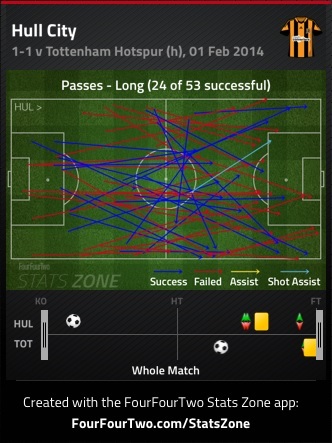 Eriksen received 47 passes, including ten that crossed from Spurs half into Hull’s. Eriksen was able to complete 17 of 20 passes in the final third, 40 of 50 passes overall and had three shots from outside the area. Unfortunately, two of those shots were off target and one was blocked. He did hit Adebayor with six passes, two received inside the area, and also found Soldado with a pass eight times. But Hull did a solid defensive job inside their own area and Eriksen’s ability to roam didn’t end up hurting Hull. Spurs also showed an ability to counter effectively, at least in terms of getting from their own half into Hull’s defensive third, with rapid sequences of passes on the ground. In the snapshot below Spurs move from their defensive third into Hull’s area with five well placed passes and win a corner. Adebayor showed yet another dimension to his game against Hull, his ability to hold up back to goal against a centerback and take passes into feet and then look to layoff. Yet again, in this match Spurs were able on several occasions to hit Adebayor with a pass in or around Hull’s area from a central position because of the space in between the lines. Below, one such instance shows Adebayor receive a pass and then lay it off moments later to Eriksen(who’s not in screen) at the top of the area who then gets his blocked shot off and it goes out for a corner. The goal scored by Hull highlights well enough why there is a need for a more defensive minded midfield player on the pitch for Spurs, despite Les Ferdinand’s comments this week that he doesn’t like holding midfielders. He wants his midfield players to be more complete players, capable of contributing to the build up and attack play and also playing a role defensively. But that’s what all managers want, ideally, yes, you would want complete players in the central areas, but they are not so easy to find or cheap to acquire, there are only so many Sergio Busquets type players to go around. What can be done in to replicate this type of player? One, is to play a double pivot, two deep mids who take going forward in turns, with a strong understanding that if one goes, the other one stays. Spurs haven’t been able to find a partnership that has worked in this capacity so far, as it does for Man City and Chelsea quite well. Secondly, the creator/destroyer central pairing in a 4-4-2/4-4-1-1, which Spurs fans will remember Harry employing with Sandro and Luka Modric to great effect in the past, Sherwood hasn’t really given this a go yet either, that even Harry recognized the need for a Sandro or Scott Parker type in midfield is damning even more of Sherwood’s nativity. Those are two options to avoid the holding midfield player being run out in a 4-1-4-1/4-3-3 that Sherwood and Ferdinand fear doing so badly. Or they could just play a holding mid and admit they do not have a Sergio Busquets type player kicking around at the Lane at the moment. So long as they continue with this preference of selection, Spurs will continue to see problems in the middle of the park. Spurs interception chart below shows a glaring lack of interceptions made in the particular area of the field where a holding mid would take up his position. The match did display the contrast in styles that two teams can have while playing the same basic formation, no 4-4-2s are the same and we saw that clearly in this match. But just because Spurs version of 4-4-2 is not “orthodox” does not mean it can and will always be effective. Sherwood moved away from it for a while and fielded a 4-1-4-1 to good effect against Swansea but it will be interesting to see if he will break away from it again. And once Sandro is fit he will have the option of pairing him with his Brazilian counterpart, Paulinho, or his buddy from last season, Dembele, in the center of the park. If he chooses not to use the creator/destroyer tandem with a fully fit Sandro, who has proven himself in the Premier League, at his disposal, serious questions will start to be asked about Sherwood. In the meantime, Hull City can come away from this match the much happier of the two sides, as they took a valuable point from a relatively in form, big club and having done so by executing their game plan better than the boys from the Lane. Bruce’s approach created a goal and stifled Spurs creativity and open football well enough to take something from the match, he succeeded where Stoke, Palace,Swansea and even Manchester United failed, putting the breaks on Sherwood’s free flowing football and making them pay for their defensive shortcomings.